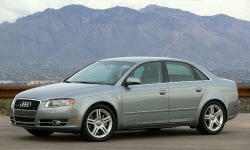 Why the 2007 Audi A4? Loaded with bells and whistles, safety features. Superb AWD system. Small 2.0T has far more torque than 6 cylinder BMW 328xi. 30+ MPG on the highway. Why Not the 2007 Audi A4? My second A4 is better than the last, but I am glad I leased instead of buying. Reliability is just not world class.